The following events are planned for Vista Virtual School students throughout the year (in both Calgary and Edmonton). All students are welcome to sign up for any of the events or activities—however, some of the events are most appropriate for certain ages or grades. For more information or to sign up, contact vvsactivities@phrd.ab.ca. See the specific events below in the table or the expandable menus. Read more VVS Stories about our students and events. 1 to 3 p.m. Grades 7-12 (note: CAUTION FOR SENSITIVE VIEWERS—this exhibition contains real human and animal specimens, which explain the various systems of the body, including the reproductive system). 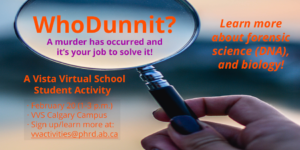 What: A murder has occurred, and it’s your job to find out WhoDunnit! When: February 20 from 1-3 p.m. Relevant Learning: Forensic studies, biology and science. You are working in a forensic lab and have isolated DNA from a drop of blood left behind by the culprit at the scene of a crime. DNA samples have been obtained from the possible villains. Your task is to carry out a “DNA fingerprint” test to try to determine which suspect matches the DNA sample recovered at the crime scene. Sign up: vvactivities@phrd.ab.ca Register now, as limited spaces are available! When: February 21 from 1 to 3 p.m. Relevant Learning: Opportunity to explore the intricate biology, zoology and physiology of the world’s most spectacular creatures, large and small—skeletal foundations, muscles, tendons and ligaments, and the internal circuit of the nervous system. When: March 28 from 9:30 a.m. to 2 p.m. Relevant Learning: Opportunity to explore career options and assist with future planning for post-secondary, on-the-job training and apprenticeship programs. Explore hands-on simulated career tasks, and learn about future opportunities at SAIT. When: May 1 from 11:30 a.m. to 2 p.m.
* Registration is limited to English 20-1/20-1 Adult and English 30-1/30-1 Adult students until April 5. Relevant Learning: Opportunity to attend a live production of a Shakespearean piece, the matinee will include excerpts from other Shakespeare pieces. It gives students the opportunity to see a Shakespeare play brought to life. Sign up: vvactivities@phrd.ab.ca Register now, as limited spaces are available! Deadline to sign up is April 24. When: May 14 from 1-3 p.m. Relevant Learning: Vista Virtual School’s Academic Counselors, Andrea Robin (Calgary) and Lise Pethybridge (Edmonton), will discuss course streaming, what is required for a high school diploma, and help you to complete a diploma planning chart. 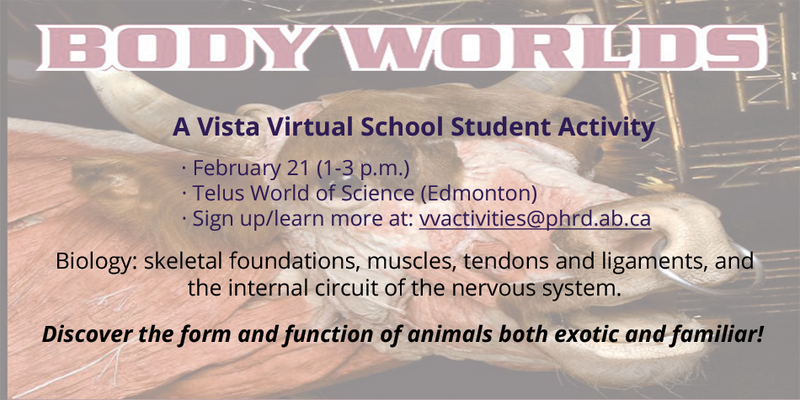 Sign up: vvactivities@phrd.ab.ca Register now, as limited spaces are available! Deadline to sign up is May 10.